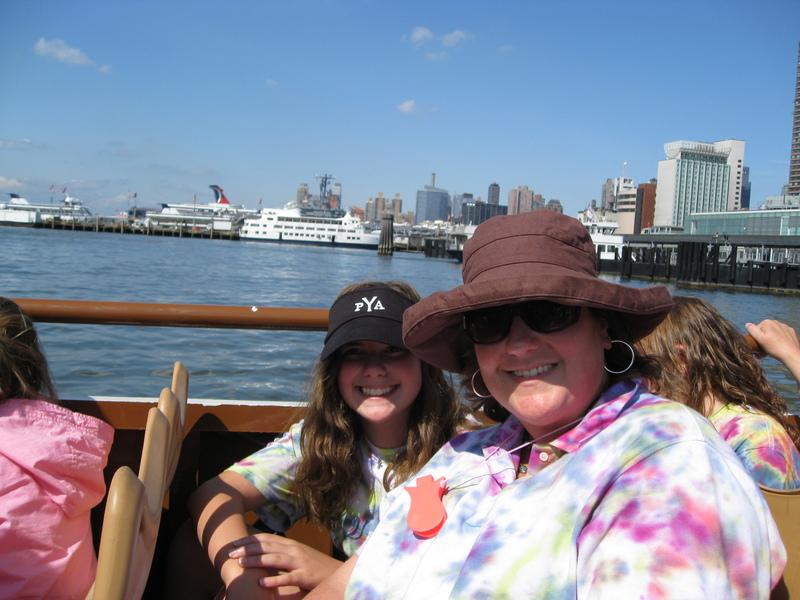 March 25,2012-Another incredible Week to Remember…. 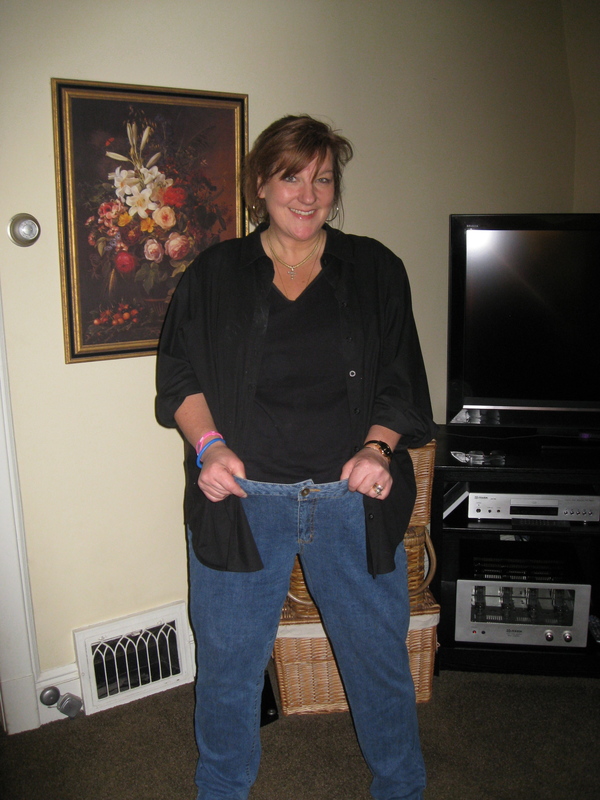 March 25,2012-Another incredible Week to Remember….Conquered my first Race Day of Spinning, tried a rowing class, lost another 3.2 pounds-which lead to a big weight loss number….50.8 pounds!!!!!! This was another incredible week of more new “firsts” in my life. Even as I type this, I look back on the week with utter amazement, and pray that I can put into words what took place this week, so that even just one person reading this would be inspired to realize that…. With God, ALL things are possible. As I type this, there are 2 weeks left until my final weigh in of this Transformation Nation Challenge. I remember, in October, watching Dr. Oz announce the challenge, and I literally sat up from laying down on the couch, and I sat on the edge of the couch with my notebook, and started to write down everything he was saying, and an overwhelming feeling came over me that it was time to do this, and an incredible belief came over me, feeling that..not only could I do this, but I truly believed that I could win the entire challenge. That was in October. I didn’t belong to a gym, didn’t have a workout buddy, didn’t have a plan, hadn’t set up a great exercise schedule..hadn’t put myself first for as long as I could remember. How could I?…I had kids to take care of, responsibilities to take care of at their schools, a husband, ailing parents getting older that I had to take care of, responsibilities at home, responsibilities at church, friends who needed help….all great and important things that I had to do, and with all of that, who has time to exercise and do all that it takes to get fit? I would continue to watch the Biggest Loser and other inspiring shows, or even see friends who had finally conquered the battle, and I would just keep praying, “Lord, please just give me the motivation. Why can’t I do it? I’m competitive, I was an amazing athlete all through my childhood and into High School. Why can’t I find what I need to do this? I watch and write down all the information, I’ve tried every diet…but why can’t I connect it to a lifestyle? Am I just too old now? Do I have to just be satisfied with never looking and feeling my best again, just giving in to getting older…blaming it on perimenopause or age or slowing down? I’m not sure why it all began to “click” and come together in October. As I wrote in my very first blog, Olivia and Ben Ward took me out to breakfast and believed in me. I watched 2 regular people completely change their lives in less than a year, both losing over 100 pounds each. We watched them on “make-over” week, where they saw each other transformed for the first time. Then we watched her stand on the scale and win the entire challenge. Just an ordinary guy and girl from our church, whose lives became extraordinary in less than a year. So….Here is the story of another extraordinary week…for a woman who finally got off the couch in October, and one small choice at a time, along with many prayers… got to this week. Meg and I started off the week with a bit of fear each day, because we had joined the gym around 8 or 9 weeks ago, and if you remember a former blog, we started spinning, and the instructor said that she would be training us for 8 weeks in order to accomplish a Race Day in spinning. 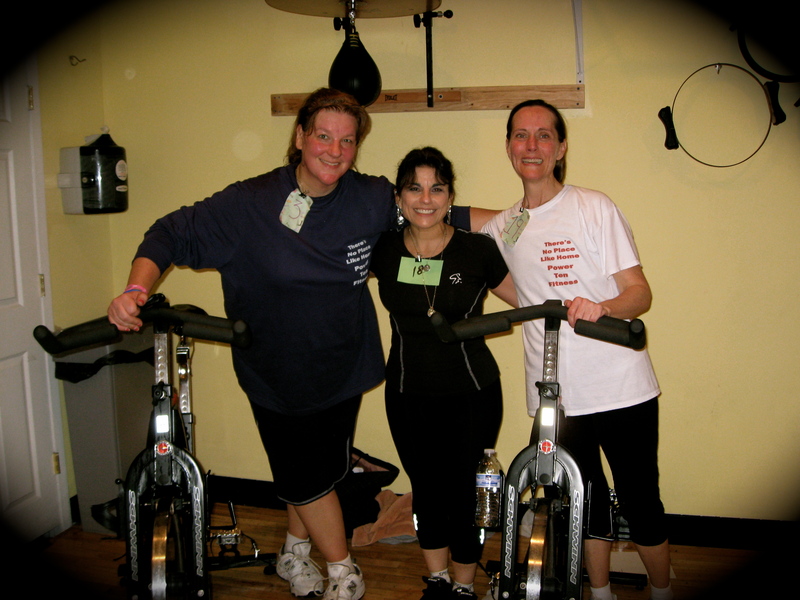 I still don’t like spinning, it is the hardest class for me, but it is also a class that I can’t believe how far I have come. The first time I went, I was happy to just keep my legs moving. I couldn’t stand and ride or jump or do anything the other riders were doing. Meg and I hung in there and kept going each week to train. We would dread every Thursday, but would always leave feeling proud of each small victory. I wrote about week 3, where we stood and jumped and kept up with everyone. In fact on Race Day, this past Thursday, I printed that journal entry out, and read it out loud in the car to Meg, because there was a place in it that stated, it was the very first time we believed that we could possibly do the race…..and there we were, this past Thursday, in the car, reading this entry…on our way to the actual race! It was incredible to read those words in the car that morning looking at where we were only 5 weeks earlier. But, let me back up a moment. On Tuesday night, some friends asked if we wanted to try a rowing class? We looked at each other and said, “why not, let’s try something new.” We were a bit nervous, but held onto all the other things we had gotten through, and thought.. “we can give it a try.” We arrived in a big warehouse where the rowing teams meet and train on all of the equipment. There was even a huge simulator rowing boat that we all got to climb into, to feel what it is like to row all together. We had a lot of laughs, and rowed for an hour, and we were really proud of ourselves for trying something new. We also left and decided, after zumba the next day, we would do a half hour on the rowing machines at the gym (now that we know how to do it) and then a half hour on the treadmill, just to break it up. It really felt empowering to know how to use another piece of equipment in the gym. On Wednesday night, Meg and I picked up shirts we had made, to put on after we completed the race. 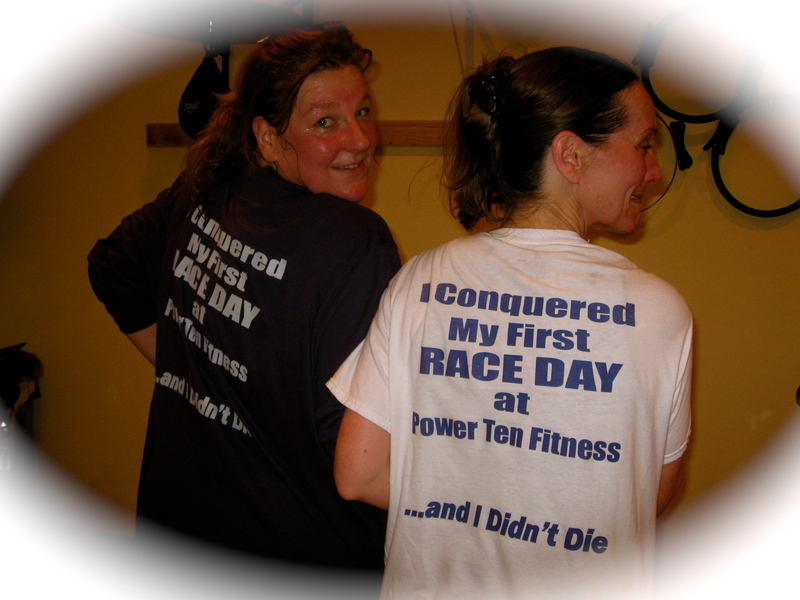 On the back it said, “ I conquered my first Race Day at Power Ten Fitness (and underneath it said in smaller letters)……and I didn’t die” On the front pocket area it said, “There’s no place like home..Power Ten Fitness.” We couldn’t wait to put them on after the race and wear them proudly. We walked in, the bikes were set up. We actually showed our shirts to a few of the instructors who wouldn’t be there when we came out. They were all really excited for us. The instructor came in, she had us choose numbers to wear, started out with an inspirational saying, told us that she would guide us through the entire race, and then started the music and put on her headset….and we started pedaling. Meg said to me,”don’t worry, the Lord is right here between us, He’ll get us through.” and the race began.. It was amazing, exhilarating, scary, hard…but the music was great, (even the theme from “Rocky” was on it at one point), and every time I thought that I couldn’t make it, I would just keep saying over and over again, the verse that I say every time I need strength to make it through really tough moments in any class, “I can do ALL things through Christ who strengthens me, I can do ALL things through Christ who strengthens me”….over and over and over again. And that’s what always gets me through. The instructor brought us through different laps and hills…standing, jumping, adding more and more resistance…and when we sprinted across the finish line with our legs burning, Meg and I both burst into tears! It was soooo overwhelming to see where we had come from, and what we were able to accomplish. Most of the race we were standing and jumping and riding hard. It was amazing! We cooled down, then got off the bikes and put our shirts on and took a bunch of pictures and hugged all the women who encouraged us to stick it out and helped us along the way, along with our amazing instructor. We left the gym that day so in awe of what we accomplished. A wonderful friend who was in the race with us, had us over to her house for yogurt and fruit and tea and it was the perfect celebration! We came home to our families who were soooo proud of us. We downloaded the pictures and sent them to everyone who has been rooting for us…it was such an amazing accomplishment which has moved us to keep dreaming and putting new goals on our wish lists! On Saturday morning, I couldn’t wait to weigh in at ww and tell them about the race. I wore my shirt and got to share about the experience, and when I got on the scale…I was another 3.2 pounds down! The woman weighing me in said, “that’s a number you really only see in the beginning of weight loss, not after all the weight you have been losing. That’s amazing.” She even said that she was praying for me and really had a good feeling about my winning. She believes I can do it. She calculated the total so far and then said…”you hit 50.8! I was sooooo excited I just yelled on the scale and threw my hands up in the air! “I’m just an ordinary woman…who serves an awesome God…who is walking through extraordinary circumstances!” What a week, filled with more amazing blessings! Please keep me in your prayers as I look forward to standing next to Dr. Oz on May 23rd when he announces the winner of this challenge! 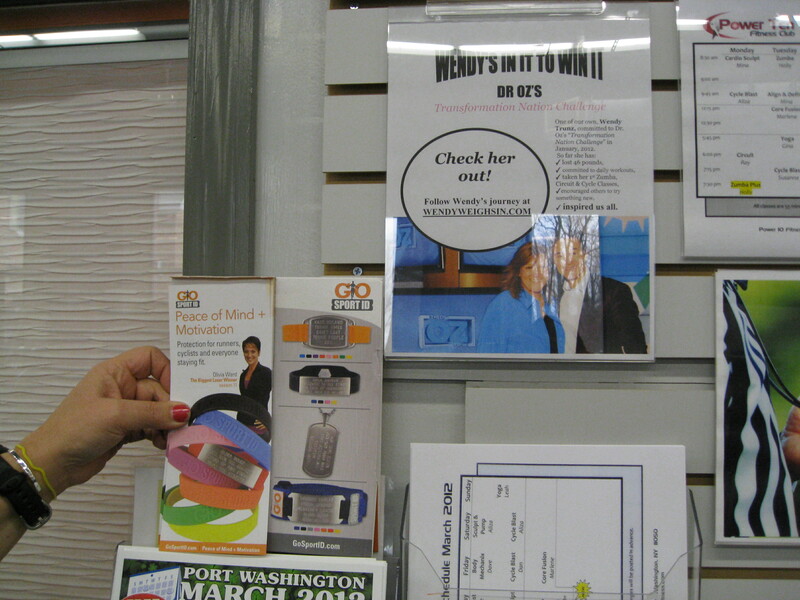 March 16-Flyers of Me are on the Walls of Power Ten Fitness Gym!! Today we went to the gym for one of our favorite classes, which we refer to as our “last chance workout” for the week, (as it is Friday, and weigh in at WW is every Saturday morning). As we stopped and signed in for the class, someone pointed at the wall and said, “isn’t that you?”, then Meg said, “Wendy, look, it’s you!”…I looked up on the wall, and there was a framed flyer all made up about me and the challenge, with the picture of me and Dr. Oz on it. I stood there and read everything it said, and tears welled up in my eyes. I was ON the wall of the Power Ten Fitness gym!! !…not only on that wall, but another one was right at the door when you walk in! Another absolutely incredible moment in this journey, that I will NEVER forget. I turned around, and the owner of the gym was training someone, but I just had to run over and hug him and thank him. He, along with my zumba instructor got together and created it, and framed them and hung them on the walls of the gym…for me.….WOW! Who gets to experience something like that, without being some sort of celebrity? Even as I type this, I still can’t believe it happened. I was also thinking, my day is crazy today, but I have to grab my husband and my friend as soon as they are both home, and bring them back to the gym to walk in and experience what I just experienced…..and of course, to take pictures of it! We met in the parking lot later that afternoon, and they had no idea why I was taking them in (both of them actually thought I signed them up for a class or something). We walked through the door, and I stopped right in front of the framed flyer, and just watched their faces….they were sooo excited for me. We took pictures, then walked back out in the parking and they just took it all in with me. It was truly another extraordinary experience in this journey. I actually left a note at the gym telling them that this experience and what they did for me was just as exciting as standing next to Dr. Oz the other day….at it was! I am heading to bed… sore from the work out, exhausted and excited from the day, still smiling, beaming from this experience…looking forward to weighing in tomorrow morning at weight watchers…and my prayers as my head hits my pillow tonight will be filled with thank-you’s for this day that was filled with more incredible blessings! Yes, He is even more wonderful in person! 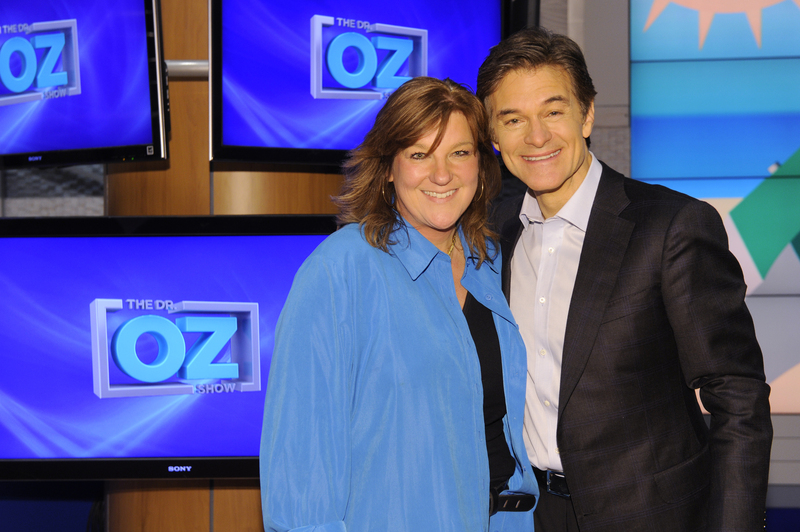 Met Dr. Oz!… Dreams Do Come True… Believe! Ok…..I just came in from N.Y.C. From the Dr. Oz show, and I am sitting here in absolute awe of how the day unfolded. I can barely catch my breath thinking about all that happened today. Dreams do come true…. Let me start with the first “God-incidence” of how I got a ticket to the show….A few weeks ago, Meg and I were coming out of a class at the gym.. all hot, sweaty and looking pretty gross. As we walked toward the door to leave, we noticed a few girls standing by the desk, looking at the schedule of classes. We went over to tell them that they would LOVE every class, I told them that I would actually do commercials for this gym, and that was saying a lot, from a girl who was petrified to even walk in a gym 3 weeks before that. We all started talking a bit, I shared with them that I was in Dr. Oz’s challenge, and they were sooo nice and mentioned that they, along with a group of girls from their children’s school, had tickets to the Dr. Oz show, and they said they would try to get me one. (OK…you did get the fact that I have never met them before…). The girls started coming to the gym and taking some classes with us, and during the vacation week, one of those women called me from Florida, while she was on vacation, to let me know that they got a ticket for me. 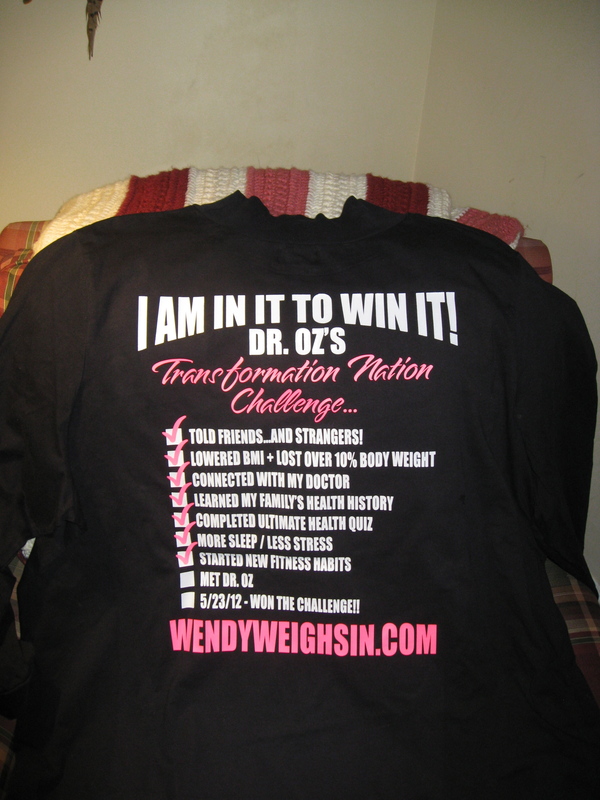 In the meantime, I started to think, if I got a ticket, maybe I could make up a great shirt to let Dr. Oz and his team know that I was in the challenge, and did all the steps I had to, to win… and that I truly believed I could win the entire challenge. During this journey, also, a friend of mine, Everardo, who is a spectacular artist, had told me that I should really have business cards made, so that when I share about my journey, I could give out a card that has my blog website on it. He came in from the city about 2 weeks ago, and spent hours creating a card for me. Then he asked to see my idea for the shirt I was thinking about, and in a matter of minutes, he sketched out the most amazing plan for the shirt. It took a whole day to find someone who would make it, but we found the perfect place that understood what we were trying to do. It would take at least a week to have made. About 2 days later, the artwork plan for the shirt was sent to me by email. I was sooo excited when I saw it, and I sent the picture of it to my Weight Watcher’s leader. Elyse was so excited for me, and asked if she could send it to the public relations people at Weight Watchers. By the following Monday, I started to receive emails from public relations at Weight Watchers, and was asked to fill out some paperwork, to give a bit of my story in about 2 pages (which was the hardest thing to do, as this journey has been one extraordinary experience after another…how was I going to convey this in less than 2 pages? ), and also send them a “before” and “after” picture so far. (That was also difficult, because I realized trying to find a “before” picture… that as overweight women, we throw out any picture we don’t like of ourselves, and the ones that are left, we are usually standing and hiding behind someone else.) It took a while, but I guess there were a few awful ones that I didn’t destroy. The other thing that I realized, was that I really haven’t taken many pictures during this journey, so I had to quickly grab something to wear and have my husband take some pictures. Someone said to, “grab the jeans that use to be tight, and now are falling off of you”. So that’s what I put on and had him take a bunch of pictures. I was really under a time restraint, and was just praying that we could quickly get this done, and that I would be happy with just one picture. When we downloaded them, I actually really liked the picture, and was so thankful to see the progress so far, even though I have a long way to go. It was really a gift to be made to stop and take some pictures right now. I will really try to do that more, so that I have the pictures along the way, as uncomfortable as that is at times. After I sent them to WW, I mailed the before and after pictures, side by side, out to a few friends, really stating under the pictures, that I chose one of my worst before pictures, which was very hard to put out there…. with that, a friend emailed back a short email that left me stunned and in tears, it said simply, “I love both Wendy’s!!!!”. Wow, that was a huge “aha moment for me”. Why is it that we don’t believe that we are seen as beautiful and loved just the way we are, feeling that “beautiful” can only be attached to us when we are at our goal weight? I’m finally understanding that I am seen as beautiful now, and was seen by friends as beautiful 46 pounds ago. Why did it take 47 years to understand that? That is going to be one of the hugest things that I want to pass on to other friends and strangers dealing with weight loss. You truly are beautiful… now. So, let me bring you back to Tuesday of my “Dr. Oz” week, (the show we went to was the Wed. taping). On Tuesday, I started to get some more exciting emails, and the last email Tues. night said that the PR people at WW got in touch with people at the Dr. Oz show, and told them to keep a look out for me and my “cute shirt”. My husband, Warren, brought the shirt home from work that night, I looked at it and couldn’t believe how perfect it was, and it was so exciting to see Everardo’s plan for the shirt come alive. I placed it on a chair and took pictures of it. I got everything together for the next morning, planned out an alternative outfit in case they made me take it off (as the notes for the audience stated “no words or logos”, went to bed with the shirt hanging next to my bed, looking at it and just praying that the Lord would continue to orchestrate the next day, praising Him for what He had done so far, and just asking Him to help me walk through the day, showing me what to do, and giving me the right words to be able to express to anyone I would talk to at the show, this amazing journey, and how it has been something bigger than I could have ever imagined. I know it is much bigger than I am, and I just want to continue to walk through it with God’s wisdom and grace. There was a couple standing near the table, waiting for the show, listening to what I was sharing, and the man said, “I think we should get a picture with you, I think you are going to be famous!”…. One of the women I was talking to, asked if I could take off the shirt, and she was going to bring it to the producers. I did, and I also asked if she could bring a packet that I created, to the producers also. 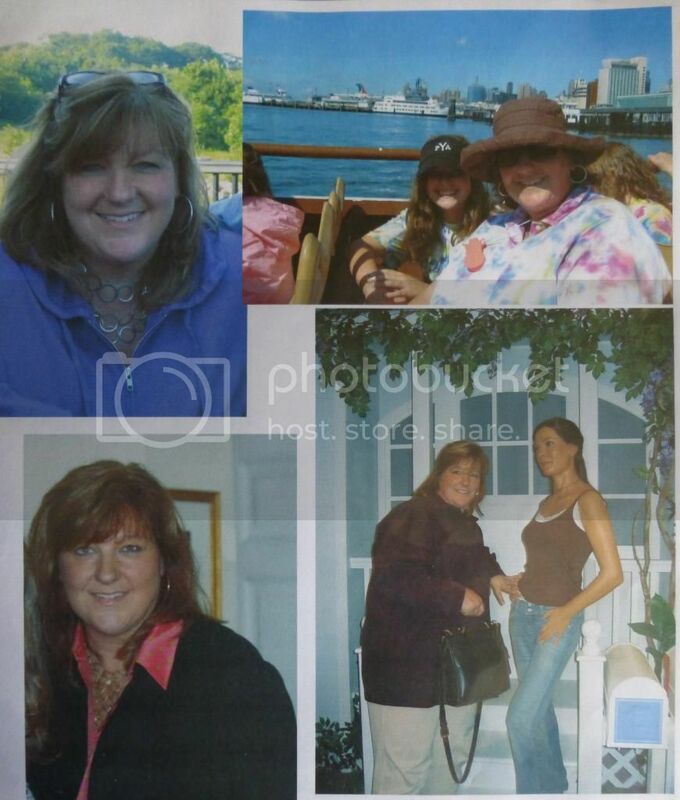 It had the packet that I created for everyone asking me what I am doing to lose the weight, along with the first 2 blog stories, my new business cards, and my before and after pictures. She was really happy for me and said that she would give it to them. We all went into the studio to get our seats, and the amazing day continued to unfold, as we were seated in the second and third rows, and I was on the end seat of the second row. The studio was beautiful, and everyone working there were so nice. The warm-up guy who takes care of the audience was fabulous! A great comedian. While we waited, another person came up to me and asked more about my story and weight loss, and then she said that they have never seen a shirt like mine, and they wanted to keep it and possibly have me back on the show. They are looking to ask some people who have been successful in the challenge to come on and share. I asked if maybe I could meet Dr. Oz and have him check the “met Dr. Oz” box, but she said that they really wanted to wait and do it when I possibly came back. I had told her already that this was all so much bigger than me, and I trusted her and would do anything that they wanted. She left, and I sat there thanking God for the opportunity of talking to everyone so far, and just asked Him to take all that I had given them…the shirt and packet, and place it in the right hands, and let His will be done. I was a little sad that I wouldn’t be meeting Dr. Oz today, but trusted that I someday would. The show was so much fun! Great information, a wonderful interview with Kristen Johnston, and Dr. Oz was even more spectacular in person! After the last segment, we were told that it was time for last applause and then Dr. Oz would be leaving. During our standing ovation, Dr. Oz came over and shook hands with the row in front of us, then he came up 2 steps and shook my hand. As he looked me in the eyes and shook my hand, I smiled and said, “I’m in your million dollar challenge, and I believe I’m going to win the entire thing.” He smiled, said something that I didn’t hear, and kept going to shake a few more hands before leaving. I thought at that point, maybe when I am standing next to him on May 23rd, he will remember me from that moment. Not sure, but was hoping. A few minutes later, they announced that we were all to leave the studio area. It was over. I stood there for a moment, looked around and just thanked the Lord, again, for an amazing day, and thanked Him for the gift of all that had happened. As we turned to make our way up the stairs, I heard someone call out my name. I turned around, and someone from the show asked if I had a few moments. I was stunned a bit, and walked down the stairs. The girls I was with went downstairs to see if they could get a table for lunch. As I reached the floor of the studio, I was introduced to a publicist of the show and his assistant or partner. They started to ask me all kinds of questions about my weight loss, my background, my story, etc. They were soooo kind and so nice, and I was so excited to share so many of the “God-incidences” of this journey. It was a bit surreal standing on the set of Dr. Oz, telling some of my story to important people from the show. They made me feel so comfortable. We talked for a while, and then they took me over to see Dr. Oz, who had just finished taking some pictures with a few people. As I type these words at this very moment…my hands are sweating and I have chills just thinking about the next moments.. They walked me over to Dr. Oz, and as I shook his hand, I said, “Hi Dr. Oz, my name is Wendy Trunz. I am in your Million Dollar Transformation Nation Challenge, and I honestly and truly believe that I will win the entire challenge.” He said, “Oh, you’re the one who told me that, over there.” …We continued to talk for a bit, I told him some of my story. I explained how Olivia had won the Biggest Loser and met with me and said that she believed in me, and taught me so much about what she learned. I told him about watching Ben (her husband), as our worship director get thinner and thinner before our eyes. I told him that I never could have imagined during this journey, that I, as an overweight woman, could inspire others even now, before losing all the weight and being at goal. It was so surreal as I stood there, on the Dr. Oz set, in front of Dr. Oz….He was the kindest, sweetest man…he looked in my eyes and listened to every word I shared. I felt like I was the only one in that room with him, and that he had all the time in the world for me. Yes, everyone….DREAMS DO COME TRUE! ….We talked a bit more, he shared that his friend, Rick Warren (author of The Purpose Driven Life, which I have read) had recently lost so much weight On the Daniel Diet, and that so many churches were joining in. I was able to share with him that many people in our church had decided to do that for Lent, and I shared with him that that was how Ben lost most of his weight while Olivia was gone. 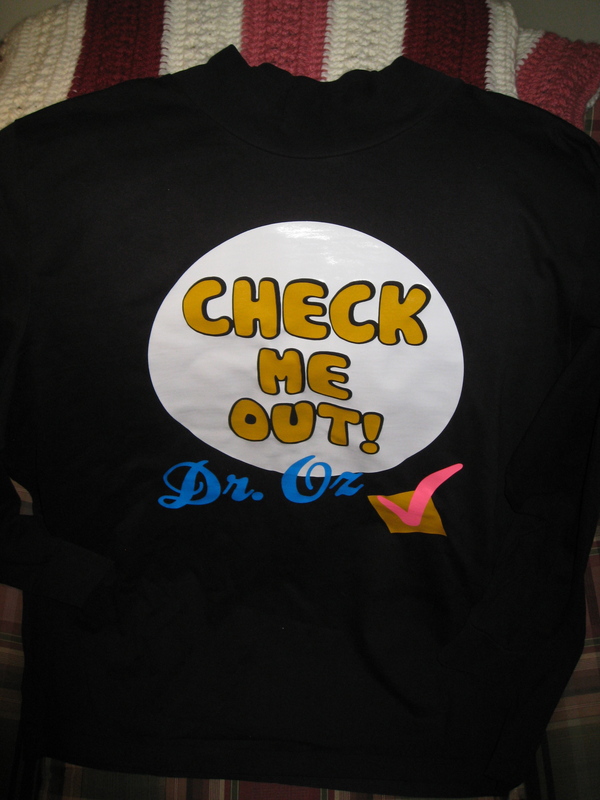 I also said that I wasn’t sure if he saw the shirt that I brought there, but I explained what the last 2 boxes said, and I told him that I would be back with my hot pink marker to check the box, “met Dr. Oz”, and then I told him that I truly believe that I will be standing next to him on the 23rd when he checks the last box, “won the challenge”. His eyes never left mine as I was talking, and at one point he said, “do you see it in her eyes, she really believes that she is going to win the whole thing. And I believe she can.” That was an incredible moment! He could see it in my eyes, Wow! After a few more stories, their photographer, with a huge lens, took a bunch of pictures of Dr. Oz and I together. He put his arm around me, and as I smiled and the camera clicked away, I just could not believe that moment was happening. I wanted someone to pinch me. After that, Dr. Oz, held my hand as he asked if everyone around me had everything they needed from me,( by the way, he has THE softest hands I have ever felt! )… and then he said that he was sorry, but had to get to a luncheon appointment. I thanked him….and he said as he walked away, “I’m sure that I will see you again.” and I said that I knew he would, and I said that I would definitely see him on the 23rd. He smiled and walked away, and there I was, still standing on the set, smiling and in awe of what just happened. The two publicists walked me out of the studio, into the elevator, and down a long hallway toward the restaurant where I would meet the girls I came with. We continued to talk and walk, and then he gave me his card, and told me that they would email me the pictures that were taken. He also said that he knew I had the blog, and he gave me permission to put the pictures up on my blog when I get them. Many times you hear people talk about the kindness of strangers, and the impact that has on people. At one point, in the studio, the publicist asked me how I actually got to come to the show today. It was great to be able to share that ultimate “God-incidence”, because I was there today, with 15 girls who I never knew before. I met a few of them at the front desk of a gym that I was originally afraid to walk into. By walking over to them and encouraging them to join…here we are today…I am standing on the actual set of the Dr. Oz show, sharing my journey so far. And again, every single “stranger” that I met and talked to from the staff that day, were the kindest people, who asked me great questions, and were really interested in hearing my story, and really congratulated me on the weight loss so far. I have never met them, I’m sure that everyone is always wanting to talk with all of them, and again, each one of them spent so much time with me and really made me feel special today. I gave out my cards to some of them, and I hope that they read this story, mainly to just hear how thankful I am, and how special they made me feel. I know that I am in this million dollar challenge, and I truly believe in my heart that I can be the one standing next to Dr. Oz, once again, on May 23rd. I also believe that this whole journey is much bigger, and is even more than winning this challenge… But today, March 7h, Dr. Oz, and every one of his staff, and the girls who shared this day with me….made me feel like a million bucks! What an incredible day…..it’s one of those days that dreams are made of….and yes…Dreams do come true…BELIEVE!! Just got in from WW. I was excited to go, knowing everyone would help me get through another week, but wasn’t sure what the scale would say, as I had 2 amazing weeks of doing everything right, yet only had a 1 pound loss. As I wrote before, I went into the week holding onto everything I had learned so far, along with holding onto the promises from everyone who had been where I was now,… assurances that if I kept doing the right things, the scale would catch up. I stepped on the scale, the man who weighed me in said, “I’m proud of you, you did a good job”, then as he was writing, he said,”you lost 3.2 pounds” (46.2 total now). The woman next to him, Jennifer, is the woman who usually weighs me in, and she has been the one who keeps telling me to hang tough, and the scale will catch up. Well, I shouted out, “The scale finally caught up!”, jumped off the scale and ran over to give her a high five! It was a great moment this morning. A few of the other members who were in the same predicament last week, also saw the scale move. And yes, there were some who didn’t, but they came in and stayed, and it was time to encourage them this week, as they did for me last week. The theme this week was exercising, and all the excuses we make to avoid it. I’m really happy and proud that I am now at a place where I am committing to exercise at least 5 times a week. When they talked about the benefits of it today…more energy, less stress, better numbers at your doctor visits…I really was thankful that I had experienced all of that in the last few weeks. It’s not always easy to make the effort and go, and there are classes I am still afraid of…but Elyse shared another very profound statement today with all of us….”you will NEVER regret exercising…you will regret not exercising”. It is so true. Even when I am afraid to go, or fearful of not being able to do something, or even not sure if I can complete a class or do another extra mile on the treadmill…when I press through and complete it and it’s over…I feel absolutely great every single time! Sweaty, gross, tired, exhausted…yet always along with it…empowered and proud of the accomplishment. It definitely sets the tone for my day now. This past week has been filled with the most amazing “God-incidences” that I can’t wait to write about. A close friend lost 2 pounds at a family resort that had plenty of incredible food, but she held onto the fact that I had lost 6 pounds on the Disney Cruise on Thanksgiving weekend, and we are celebrating her amazing success of losing weight during that vacation week….I met a few girls at the gym who were new, and when they found out that I was in Dr. Oz’s challenge, they actually got me a ticket to go to the show with them THIS Wednesday!!…. A dear friend, who is an amazing artist (you can see his work at http://www.lalinstudio.com) came out to Long Island to help me create business cards to share this blog and my journey with others, he also helped me create an amazing shirt to wear to the Dr. Oz show. 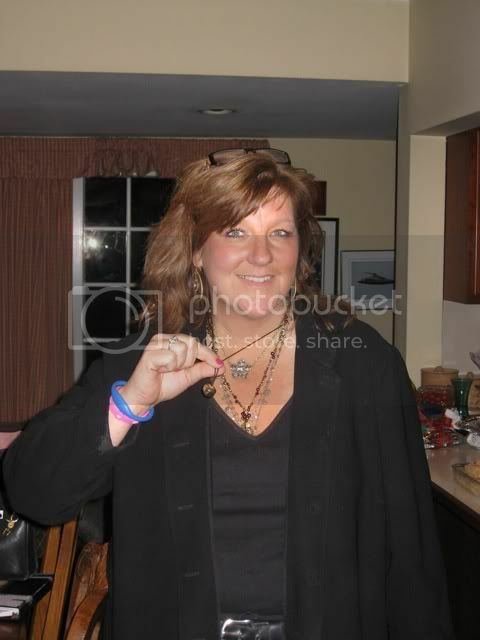 I will post pictures in the coming days after I pick it up….Yesterday, my business cards arrived in the mail ( I have never had a business card in my life), and last night I went to a ladies night out of shopping to raise money for a school. I ended up talking to a woman who made beautiful leather pocket books. We chatted for a bit, and as we got on my Dr. Oz story, she told me wonderful stories about him as she use to be a phlebotomist at the same hospital and worked with him. She said he was as wonderful and special in real life, as he is on the show. She, along with the wonderful man she was with, both asked for my cards and told me that they believed in me and would vote for me when it was time. 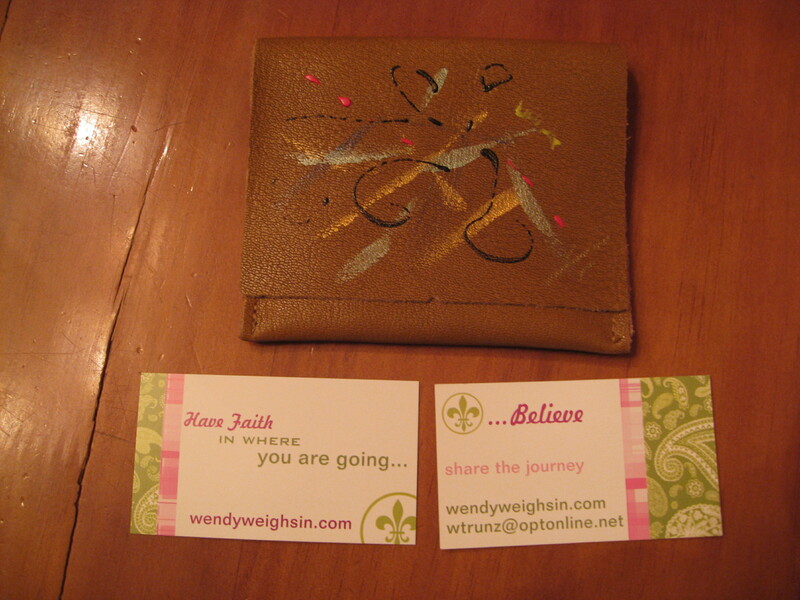 We talked a bit more, and then she said, “I really want to bless you, and would like to give you one of my business card holders that I made”. She pointed to the end of the table where all of the beautiful holders were. I said that she didn’t have to do that, I would buy one. She sweetly said, “are you raising your voice at me while I am trying to bless you?” I smiled, and the moment left me speechless. All I could think was, “wow Lord, this journey is so much bigger than I could have ever imagined!” Really… what is the chance that on the day that I receive business cards for the first time ever in my life, that I would then be out at night at a school I have never been to, meeting a woman I have never met, who worked with Dr. Oz, and now wants to “bless me” with a business card holder that she made with her own hands? WOW! I told her to pick one out for me that she loved making. I stood there, and I put my business cards in one section, and in the outside pocket, I put her business card so that I would forever remember this woman, Winnie, who never met me before, and chose to bless me with this beautiful gift this night. As I walked out of the auditorium she said loudly in her kind, sweet voice, “ I love you!”, and without hesitation I responded, “I love you, too!” (and I did)…and I walked out into the rainy night to my car, with tears in my eyes, smiling…goosebumps all over, in total awe of what happened, looking up into the dark cloudy sky just thanking God for what He was continuing to orchestrate in such an awesome way. I couldn’t wait to get in the car and call my husband, to try to put into words what just happened. 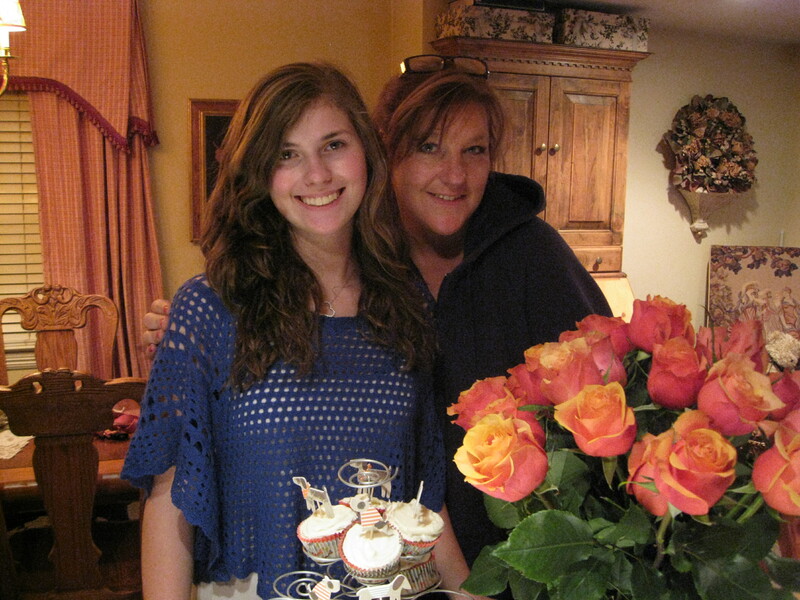 I have been sharing last night’s story with my family, friend’s and children all day, and now with all of you…. I am excited to keep writing and sharing all that is happening, and look forward to what continues to unfold, day after day. Thank you, again and again… for joining in this with me…. For all of your encouragement and powerful words that keep me going and persevering. I am blessed beyond words!